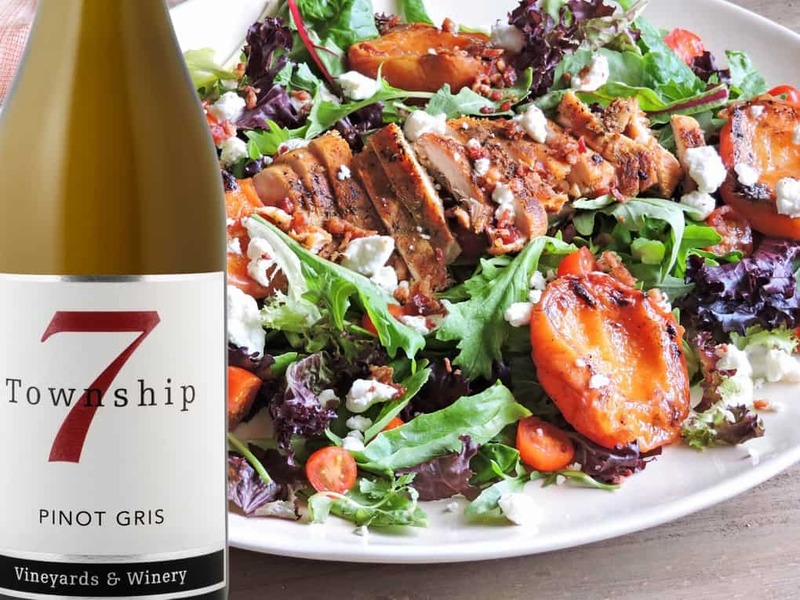 It's the first week of spring and we're celebrating with a tasty and pretty salad paired with our delightfully fresh 2017 Pinot Gris, which was just rated "excellent" by Great Northwest Wine Magazine! As beautiful as it looks, this colourful recipe is easy to pull together and makes a perfect accompaniment for a spring picnic. The dish is also ideal with our single vineyard Pinot Gris, sourced from Hidden Terrace Vineyard in north Oliver. The vibrant peach aromas of this unoaked wine is a great match for the juicy peaches of the salad. And the wine’s refreshing palate makes for a nice counterpoint to the tangy sweet/sour dressing. In a small bowl; whisk all of the dressing ingredients together; set aside. Separate the salad mixture between two plates and evenly divide the dressing over the salad.